A year ago, I washed my face with water. I scoffed at any elaborate skin routine. I used coconut oil and frankincense essential oil to moisturize and tone. I didn't think I needed anything else and my skin looked pretty good in my opinion. Fast forward to this morning: I washed my face with Beautycounter's nourishing cream cleaner. Then, I used the Countermatch serum, eye cream, and face lotion. I followed that up with their Dew Skin tinted moisturizer, a bit of volumizing mascara, lip gloss, and touch of concealer. And I couldn't be happier with the change! As I ease into my 41st year, I'm shocked to say my skin is looking even better than it did a year ago. My eyes are less puffy and my skin tone is more even. I feel totally comfortable without any makeup. I think what has helped the most is diligent use of Beautycounter's new Countermatch Collection. I've been using it the past few months. Honestly, at first I thought it was ok. It feels super light, so in my mind, I wasn't feeling like it was hydrating enough. But, once winter rolled around, I realized my skin wasn't dry at all. And I noticed that the skin under my eye wasn't as dark. I also woke up looking way better! Ha! The night time recovery cream was doing something magical at night. What really sent me from really liking to LOVING the Countermatch collection, was when I traveled to Mexico over Christmas. I continued with the regimen there and was shocked to report that my skin looked just as great even though the weather and environment was completely different. As I read about Countermatch, I learned that this was because these products use something called bio-mimic technology. The composition of the products match the composition of the skin so it adapts to the environment and gives the skin what it needs at that time. Crazy, right? This is cutting-edge technology created by Beautycounter's Chief Technology Officer. In Colorado, it keeps my skin moisturized. In Mexico, it kept it moisturized without feeling oily. When you purchase a regimen, you save $$$! As a 40 year old woman with normal to dry to sometimes oily skin, the Countermatch regimen works great. I highly recommend it to all of my friends and clients. 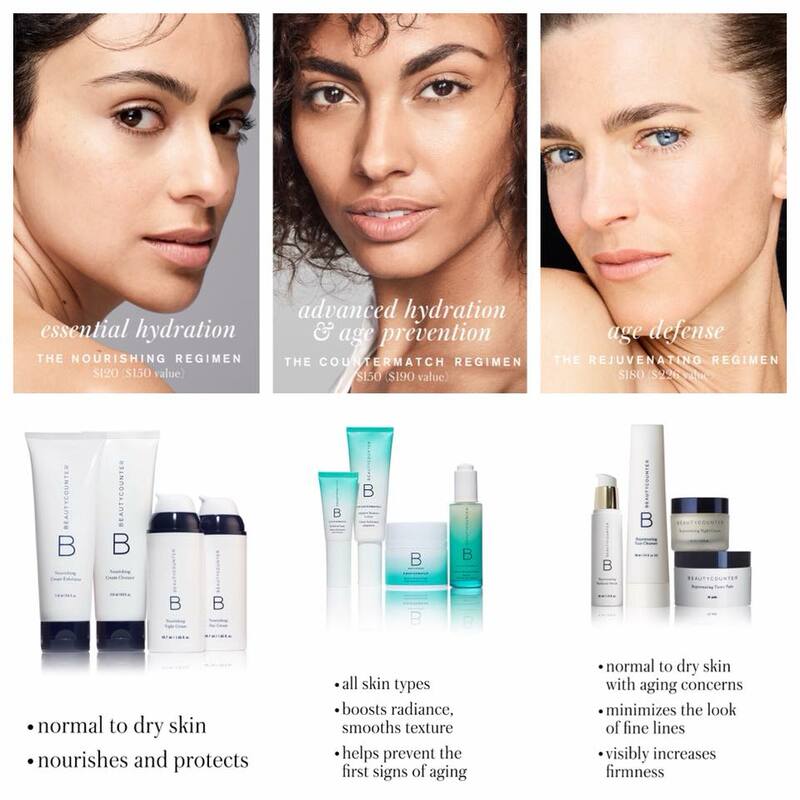 If you're dealing with other skin issues, take a look at Beautycounter's two other skin care regimens: Essential Hydration and Age Defense. I've also used both of these as well and they work really well. If your skin is fairly normal, the essential hydration combo is gentle and effective. If you're very concerned with aging skin, the age defense is for you. Need help choosing which one is right for you? Reply to this email and I'll see if I can help! Would you like to make a purchase with me as your consultant? Please use this LINK.